If videos are one of the modern tools for personal Agile training and Scrum knowledge acquisition, podcasts can also play an important role. Audio-only material is useful in a context where the eyes are already busy, when you commute in your car for instance. 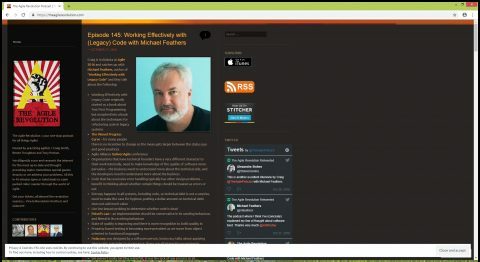 This article lists active Agile and Scrum podcasts. Most episodes are available as mp3 files that can be downloaded. Other are available only in certain audio or video distribution platforms like SoundCloud , iTunes or YouTube. The active Agile and Scrum podcasts mentioned in this article are: Agile.fm, Agile Answers, Agile Amped, Agile Chicago Style, Agile Chuck Wagon, Agile Coffee, Agile for Human, Agile in 3 Minutes, Agile Revolution, Agile Toolkit Podcast, Agile Uprising, Badass Agile Podcast, Deliver It Cast, JoinAgile, LeadingAgile, Meta-Cast, Scrum Master Toolbox, This Agile Life, Troubleshooting Agile, Why Agile Transformations Fails. Do not hesitate to suggest important Agile and Scrum podcasts that are missing from this list using the contact form. Agile.FM defines itself as “The Radio for the Agile Community”. This podcast managed by Jochen Krebs hosts thought leaders of the Agile and Scrum community like Ken Schwaber, Jeff Sutherland, Woody Zuill, Ellen Gottesdiener or Ken Rubin. In each Agile Answers podcast, Certified Scrum Trainer and Agile coach Adam Weisbart aims to help real people overcome real-world problems by providing easy-to-follow instructions that give you the tools you need to conquer your Agile challenges. The Agile Chicago Style Podcast was created in response to an Agile Day Chicago 2014 Open Space idea, to Ignite the Chicago Agile Community. Topics discussed in recent podcasts include “The Rise and Fall of Agile Community, with Mike Marchi & Jeffsingleton”, “Visualization & Collaboration, with Maria Matarelli” or “5 ScrumMasters You Will Meet in Hell, with David Saboe”. 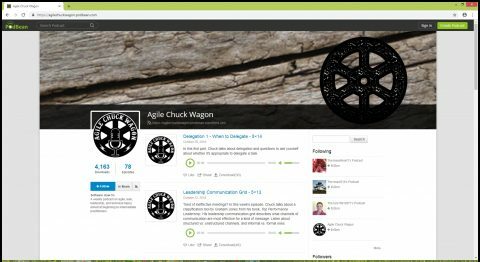 The Agile Chuck Wagon is a weekly podcast on agile, lean, leadership, and technical topics aimed at beginning to intermediate practitioners. 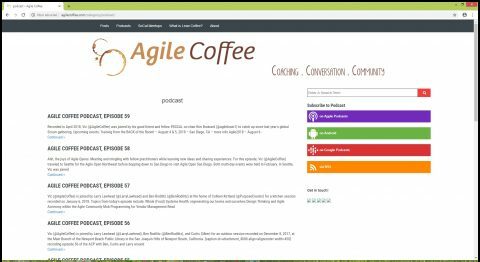 The Agile Coffee podcast is produced by Victor Bonacci. It aims at meeting and mingling with fellow Agile practitioners while learning new ideas and sharing experiences. This is why it is often recorded at Agile conferences like the Scrum Gathering. 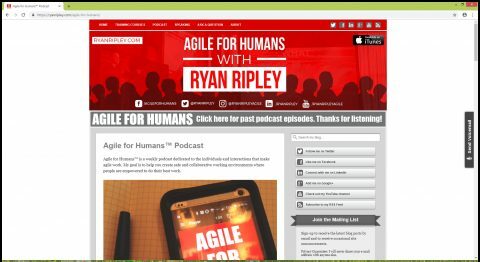 The Agile for Humans podcast is produced by Ryan Ripley and defines itself as “dedicated to the individuals and interactions that make agile work”. In the most recent Agile for Humans podcast episodes, you can find some of the following topics “Sprint Retrospective Ideas for Scrum Masters”, “Improve Your Agile Hiring Practices”, Exploring the 3 V’s of Product Ownership” or “Systems Thinking in Agile”. Agile in 3 Minutes defines itself as a “micropodcast about thinking and doing business effectively.” Currently in it third season, the Agile in 3 Minutes podcast provides knowledge about many various topics from Mob Programming to Newton law of motion or active listening. The last season is more special with the presence of guests like Johanna Rothman. The Agile Revolution is a Agile podcast hosted by Craig Smith, Renee Troughton and Tony Ponton. They often have external guests like in the recent episodes that include “Mob Programming & #noestimates with Woody Zuill”, “Working Effectively with (Legacy) Code with Michael Feathers” or “Agile Coaching with a Latin Touch with Martin Alaimo”. 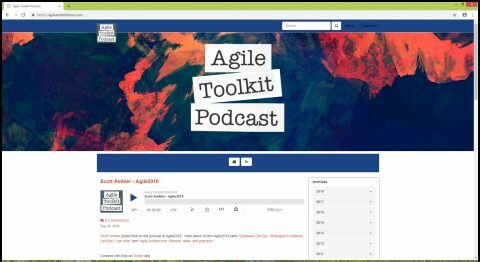 The Agile Toolkit Podcast is hosted by Bob Payne and provides conversations about Agile Software Development, Agile Methodologies, techniques and tools. In every episode, a guest is invited to create the conversation. Past guest include famous Agile gurus like eff Sutherland or Scott Ambler. Agile Uprising is a purpose-built network that focuses on the advancement of the agile mindset and global professional networking between and among practicing agilists. In the Agile Uprising podcasts you can find topics like “What is a team?” or “The Dark Side of Coaching”. The Badass Agile Podcast aims to provide each week a short, powerful reflection on experiences, mindset and habit pairs, and current trends. Among the topics of recent episodes, you find “Does your team really shoot for the moon?”, “Does Creativity Matter in your Agile Leadership Journey” or “Do you have to be a Scrum Master – or an Agile Practitioner – to be in the business of Agility?”. Deliver It is a podcast for Product Owners. It is hosted Cory Bryan (and sometimes guests) bring their experience and ideas on how to improve the role and techniques they use to deliver value within an Agile framework. Topics discussed in the Deliver It podcasts include multiple Product Owners, interviewing customers or reducing risk. The JoinAgile podcast is hosted by Dmitri Iarandine. It proposes to learn about Lean Agile Management and Delivery methods, values, principles, practices from a professional Agile Coach, in a relaxed and informal atmosphere of these fortnightly podcast episodes! LeadingAgile is the Agile consulting company of Mike Cottmeyer. In the LeadingAgile podcasts, the company consultants perform some Q&A with Mike Cottmeyer and discusses topics like “How Tooling and Reporting Enable Transformation” or “Addressing Your CFO’s Concerns To An Enterprise-Wide Agile Transformation”. Meta-Cast is an Agile podcast focused on helping agile teams produced by Bob Galen and Josh Anderson. In the last episodes of the Meta-Cast podcast, the hosts discussed topics like “Agile Coaches Are Scary”, “Troublesome Team Members” or “Just The Right Amount of Agile Process”. The Scrum Master Toolbox podcast is aimed at providing “how to” knowledge for Scrum Masters and Agile Coaches. Among the topics discussed in recent podcasts you can find “Change models, and change practice for Scrum Masters”,”How Scrum Masters can help teams address conflict without a blow-up” or “How Agile Retrospectives are the core of the change process”. This Agile Life is an Agile podcast hosted by different persons that discusses what it is like to be agile in the real world. Troubleshooting Agile is a book written by Jeffrey Fredrick and Douglas Squirrel, that has an accompanying podcast. Some of the topics presented in this podcast are “How to Fail by Acting Unilaterally “, “Engagement and Joy in Agile Teams” or “The Post-It Factory Game”.